On a bus between here and there, a lot passes you by. Cars, buses, trucks, a lot of gray. Most of it goes without notice, but sometimes something sticks out. In 10th grade physics, it’s simple and basic. But it struck me for the first time how, in another context, that phrase might mean something entirely different. Distance over time. Two meanings: mathematics vs. poetry. In terms of running shoes, speed is measured in the distance traveled divided by the time it took to get there. But to a more poetic heart, distance is something that can be achieved over time, with patience. Don’t ask why. Just grab some goggles and dive in. 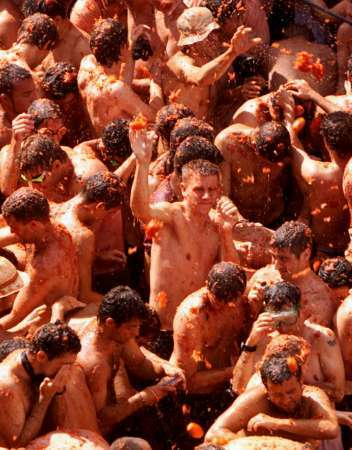 Yesterday was the date of this year’s Tomatina, a marvelous little festival in Buñol, Spain, a half-hour train ride west of Valencia. 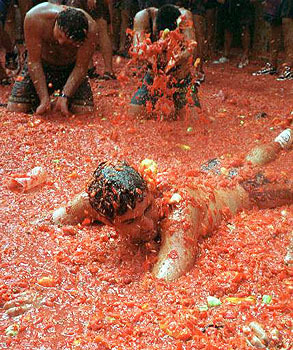 On the last Wednesday of every August, this little village puts on a week-long, tomato-themed party, set around the feast of its patron saint, and closes it all out with the world’s biggest food fight. Most out-of-towners show up just for this last part. It is an event that occupies a large and happy spot in my heart because seven years ago I was there. My partner, our roommate Mike and his sister Claudia jumped at the chance to see the tomato festival that year when Mike read about it in Details. It was just a single-paragraph brief with a little picture, tucked in the corner of the page — and we planned an entire 17-day road trip through southeastern Spain around that date in August 1999. We saw major cultural landmarks — Alhambra, the walled medieval city of Toledo, breathtaking Gaudí architecture in Barçelona, the mosque-cathedral of Cordoba — but really… really, we threw tomatoes. A veritable Who’s Who of nations are represented at this obscure food fi— er… I mean festival. This modest, sleepy village of roughly 10,000 swells to a tourist destination of more than 30,000, transforming literally overnight into a cosmopolitan mecca drawing Spaniards, Americans, Australians, Brits, Italians, Germans — everyone. I’ll set the scene: Imagine thousands and thousands of men and hundreds of women, nearly naked, writhing in a river of crushed tomatoes. Here’s a fairly decent presentation of the fight online. Hot guys. Hot girls. Plus it’s a legitimate cultural expereience. We all get an A+! A legion of foreigners trickles into town, making make their way from the train station to the center of town like ants converging on a potato chip. Meanwhile, the locals spend most of the morning covering their windows, doors, balconies and storefronts with tarps, sheets of plastic, nets and mosquito screens. Many of them stand in their doorways and on their balconies, silently watching the passing visitors, waiting. When a crowd of suitable size has amassed, the locals dump buckets of water and turn garden hoses on the crowd, priming everyone for the mêlée to come. T-shirts slide off and get tucked into waistbands. The less patient among the masses tie their shirts into knotted projectiles and send them sailing back and forth above the crowd. There is some noise and nervous chatter. From time to time, when a resident lets loose again with a garden hose, the affected segment of the crowd cheers. But mostly everyone is waiting for the sound of a gun shot. And then it starts. Enormous dump trucks filled with tomatoes come rumbling slowly up the narrow streets. A brave few scramble up the sides of the cargo holder and dive in, tossing out handfuls of loose fruit to prime the pump. The crowd is so thick that it takes time to make a space in front of the trucks and close in again behind them. Some of the streets are so narrow, the process looks like peristalsis, people pressing themselves against the walls of the buildings to let the trucks pass. And then the trucks stop and raise their loads and dump their cargo (and any instigators inside). And the fracas begins. Those closest to the piles of tomatoes scramble forward and make short work of them, tossing handfuls in all directions. They spread out like a ripple in a lake. 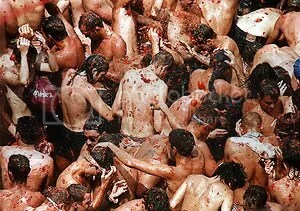 Waves of tomatoes wash across the crowd as people begin assaulting each other in earnest. Some folks crush them before tossing. Others good-naturedly pelt their neighbors with whole, solid fruit. It is considered bad form to throw the hard, unripe, green ones. They remain on the ground, mostly. An expression of good will. Not quite deep enough for a backstroke. Soon there is nothing solid to throw. The tomatoes have been reduced to an impromptu river of sauce running down the street. The late-summer sun beats down on shimmering bare backs, chests, arms, shoulders. People sludge here and there, kicking chunks in all directions. Shoes come off, or get stuck in the sucking holes of mud-like tomato slop. No one is spared. Claudia attempts to climb a street lamp to get some aerial shots of the chaos. But the crowd isn’t having it. She becomes an easy target, and a barrage of fruit (as well as a desire to not destroy her rather nice camera) soon persuades her to come back down. In the chaotic movement of bodies, a young man cups his hands and scoops great splashes of marinara at me, a complete stranger, then stands there, arms back, chest puffed out, in a gesture that says: “OK, now you hit me!” His intention is as clear as crystal. Plus he’s hot. So I comply. No one speaks. No one is from here; and no one would understand each other anyway. There is no language here. There are only tomatoes. Then a second series of trucks comes through, restarting the whole process. 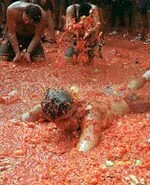 We are completely engulfed in tomato pulp. Hair is matted down, slicked back or spiked into insane formations, depending on length. Red muck slides down our faces, into our mouths. Our ears are ringing because they are filled with tomato sludge. Splashed tomato gets up our noses. We can’t rub our eyes with our filthy hands, so we rely on reflexes (or swim goggles) to avoid being blinded. Naked torsos glide past naked torsos. We slip and slide across each other. Then there is a second gun shot. The throbbing horde stops. And the locals once again have at us with their hoses. The crowd filters out of the town center through alleyways and back streets into larger clearings and squares. Buñol comes out en masse to rinse us off. Dripping participants queue up to get a quick hose-down. We gather up what clothing we can. As we wait for the hose, pulpy chunks, seeds and bits of skin cling to everything and everyone in sight. The late-summer sun bakes it to our skin, and we begin to itch in uncomfortable places. The air is heavy with the bouquet of tomato, sweat and sun-tanned skin. And the walls and streets in all directions look like the sides of a Cuisinart. I find it funny that nearly every building in town is painted some variety of white. No one seems to know why this festival exists. It’s been around since the ’40s. I’ve heard that it originally had something to do with a protest against the Franco regime. I’ve heard it started with an accidentally upturned vetegable cart that resulted in a public food fight that was so much fun the locals decided to do it again the next year. 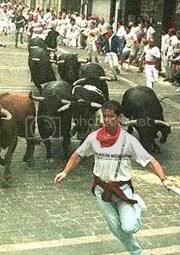 It’s a heckuva lot better than getting run down by some bulls! Maybe there doesn’t need to be a reason. It’s enough that people from all over the world come for a single, meaningless purpose. It’s a fantastic expression of community and good will and unity. Just good clean fun, metaphorically. It’s not so clean. I got the worst ear ache of my life in the days that followed. (I could see in my shadow that my misshapen ear was standing out an extra inch or more from my head!) I’m sure it’s from an infection I picked up in the melange of tomato sauce, street filth, and thousands of bodies’ worth of human germs that streamed down my face for the better part of an hour. But it was the best ear ache of my life. 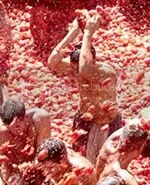 And, for the record, as far as obscure Spanish festivals go, I’d rather risk my short-term health in a tomato fight than risk my life getting chased by a bunch of bulls.